yer ker RM350...waaaa mahal bangat gitu..kalo kat kuantan paling mahal pon baru RM200..apepon hopefully aliya will save n happy with a new babysitter...sayang aliya..care aliya senyum da ader gayer damiea makcik..
oiii mahalnye nursery alisha. lily punya rm240 x masuk overtime. specil ke tmpt tu? dah nk cuci gigi ek? emm mami pun rasa nk cuci gigi lily dah jgk. nk ajar dia berus gigi..kt mana beli ubat gigi tu? a ah.. 350. mmg mahal.. sabar je lah.. harga biasa di area KL selangor ni 230 - 250 je patutnya.. tak pe lah. ahahhah.. sama ya.. leh buat geng nih..
kain..? hmm.. yg ani pernah jumpa, di jual macam plastik. dia pendek je, just sarung kat hujung jari. the brushes ada pada sarung tu. nampak cute. tp x beli lagi.. hihi..
1 year ya.. haha.. ok. kalau gitu, ubat gigi tu ani sedekah kat neil je lah.. haha.. This can be tough with an uncooperative child. My kids did not like it, so I didn't push it. If you have to put them in a head-lock to brush their teeth, they probably won't cooperate for a long time. Having a two year-old that will brush his teeth is much more important that having a 14-month old that does. * Model good dental hygiene. Let baby watch you brush. Show excitement, capitalizing on "just like mommy and daddy." Around his first birthday, get baby his own toothbrush and enjoy side-by-side brushing just for play. If you first get baby to enjoy imitating toothbrushing, it will be easier for you to get down to the business of getting germs off little teeth. * First toothbrushing. The best chances for a cooperative baby and clean teeth are to use your moistened gauze- wrapped fingertip as a toothbrush. Gauze also works well in the older baby who refuses to let you invade his mouth with a toothbrush. 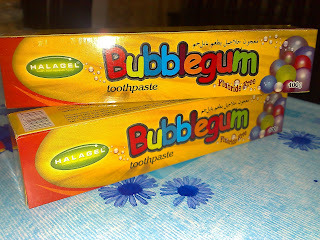 "My 13-month-old baby does not like the taste of baby toothpaste. I have been brushing her teeth with a wet toothbrush without toothpaste so she will accept the toothbrush. Even then, it is sometimes a struggle. On the last visit, my pediatrician asked if we were using the baby toothpaste and said that we should be using it. I know that it doesn't have any fluoride - so is there any other benefit to it?" Instead of struggling with the baby toothpaste, I would get a cute toothbrush with one of her favorite cartoon characters on it. Let her �play� with this toothbrush (no toothpaste) while she watches you brushing your teeth. Sing a song while you brush, and maybe she�ll follow along. Until she is ready for fluoride (usually age 2 to 3), using a dry brush is fine. This will help foster a fun relationship with the toothbrush, which will be very important when she is older and has a mouth full of teeth. Most of the local pediatric dentists that I talk to have recommended using toothpaste with fluoride as soon as your child is able to spit it out � and then only use a small �pea-sized� amount. ceta pasal ubat demam, macam mana dos nak bagi, apa nak buat bila anak demam, ubat ubat yang perlu ada dalam simpanan, etc etc..
Baby yang less than 1 month=neonate. If these babies r having fever, it is compulsory to bring them to doctor. Berat baby * 20mg= Z, Total dos ubat in mg.
Tapi, biasanya kalau baby yg kurus lbh kurang 1ml je. 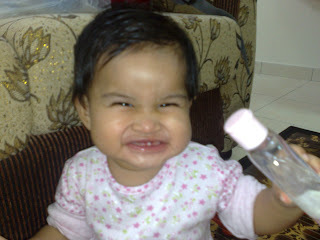 And baby yg chubby dalam 2 ml. Tapi itupun tgk guna kepekatan yg mana. The best action bagi parents yg tak pernah bagi anak dia makan ubat, ialah mintak tolong pharmacyst atau GP di klinik berbayar tolong kirakan dos. Bcoz biasanya mereka tanya semua soalan seperti allergy history and medical history sebelum prescribe ubat berkenaan. Last but not least, the best ubat utk demam ialah tanggalkan pakaiannya dan lap badan dengan air suam regularly. Kemudian jgn lap/terus pakai baju. Biarkan air yg dilap tadi tersejat dgn sendirinya. Cuba elakkan dari kipas angin atau aircond yg direct on the baby. Maximum dos panadol ialah 20mg/kg. So, kalau tak jalan ie demam tak kebah dengan dos 15mg/kg, maka blh tambah dos kepada 20mg/kg. Kira semula berapa ml dengan gunakan dos yg baru. Cara pengambilan panadol ialah setiap 4-6 jam sekali (4times or 6 times a day). Kalau demam tak kebah selepas 4 jam, blh ambil satu lagi dos. Tapi kalau tak jalan gak, maka bawa segera ke doktor (provided, we’ve done the tepid sponging)."